The Jazz Park, located in New Orleans, Louisiana, is not a large park but what it lacks in size it makes up for in importance and excitement. Guests will get to be immersed in jazz, both in history and in current times, while seeing live performances and getting to interact directly with jazz musicians. 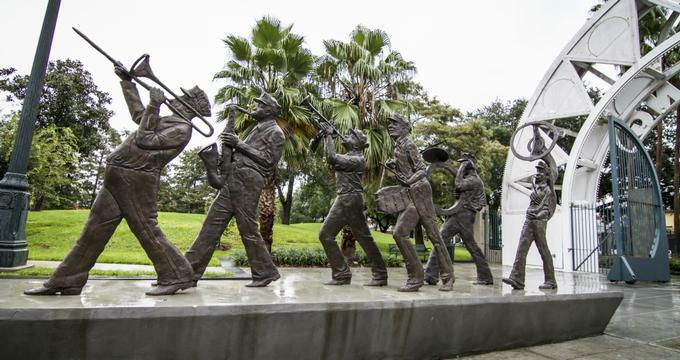 The jazz park was created in 1994 and is located near the historic French Quarter in the Treme neighborhood of New Orleans. The mission of the park is to educate the general public about the history of jazz music, as well as to get guests involved with where jazz music is currently. The staff makes sure to pay attention to the complex ways that jazz to New Orleans, even though a portion of that history is dark and terrible. Step back into time and learn why jazz has had and continues to have such an impact. Visitor Center - The visitor center, located at the Old US Mint, is a great place to start for any visit to the park. Chock full of information about the parks and maps (see below for information about self-guided tours), the visitor center is also staffed with people willing, able, and happy to answer questions before guests hit the park. There are also concerts held here, which are updated on the website frequency. Black History Month - Jazz, at its roots, is a music that is rooted in the history of the African American people. Drawing heavily on the history of slavery and the pain that has caused, jazz gave voice and brought together many different cultures to create a both cohesive and diverse musical genre. To this end, the jazz park’s historical arm produced a two-disc set of songs called Freedom is Coming, which highlights the Freedom Singers from the Underground Railroad. Songs such as “Back, Back Train,” and “Deep River,” this set hits all the major jazz highpoints. Perseverance Hall - Heading into Louis Armstrong park, guests should make sure to stop by and check out Perseverance Hall. Built in 1819 and now officially listed on the National Register of Historic Places, this former Masonic Lodge is one of the longest standing pieces of jazz history. Park Ranger discussions - Although not a traditional park with a forest or a lake, the jazz park has its own jazz park rangers that host sometimes lively discussions at the visitor center on the premises. Both informal and formal, these discussions delve deep into the history of jazz, the different elements that came together to create the music we call jazz, the different musical forms encompassed in jazz, and provide musical examples to let guests learn about the different musical genres in the world. Walking Tours - With the printable map from the website, guests can take themselves on a walking tour around the park. The map displays the major, do not miss features of the park: The Louis Armstrong statue, The Mint, the Mississippi River, and Algiers Point, among others! The park is committed to being as accessible as possible and welcomes service animals. Contact ahead of a visit with any specific questions or concerns in regard to accessibility. There are many educational opportunities for children at the jazz park. One of the most popular programs is the junior jazz ranger program, which is split up into two grade based categories (kindergarten to 3rd grade and 4th to 8th grade). In order to become a junior jazz ranger, students fill out the appropriate packet. This packet is filled with facts about jazz music, activities to complete, and information about the park. Once complete, it can be sent in and the student will receive an actual junior jazz ranger park badge. Also, once a month on a Friday morning, Johnette Downing (a well-known musician as well as a children’s author) performs at the visitor center. Her performances are generally geared toward children no older than 3rd grade, but children of all ages are welcome to attend! A full schedule of the dates she will be performing is available on the jazz park website and is frequently updated. At the visitor center, there is a small bookstore where guests can purchase gifts while also having a portion of the proceeds go directly back into support the park. With merchandise like lapel pins, magnets, patches, and maps, guests will be able to remember their visit while also supporting the park.